A federal tax lien filed in Maryland, where Moore owns a house, says that the government won a judgment against Moore for $75,328.80 for unpaid taxes from the 2014 tax year. 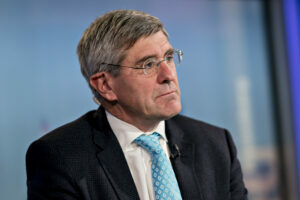 Stephen Moore, whom President Donald Trump said he’ll nominate for a seat on the Federal Reserve, owes more than $75,000 in taxes and other penalties, according to the U.S. government. A federal tax lien filed in the circuit court for Montgomery County, Maryland, where Moore owns a house, says that the government won a judgment against Moore for $75,328.80. The January 2018 filing said it was for unpaid taxes from the 2014 tax year and could accrue additional penalties and other costs. An IRS spokesman said he was prohibited by law from commenting on the case. A White House spokesman declined to comment. Moore referred questions about the tax debt to his wife, Anne Carey. Carey said the dispute originated with a deduction on Moore’s 2014 tax return in which he accidentally claimed the sum of his alimony and child-support payments to his former wife, when only alimony is deductible. Because Moore had moved, he never received notifications from the IRS after the agency audited the return, she said. The IRS disallowed the entire deduction and added penalties and interest, Carey said. She said she and Moore have now resolved to pay the lien as quickly as possible but will continue to press their dispute with the IRS. She said the couple had overpaid their taxes in more recent years by about $50,000 and will seek that amount in a refund when they file their 2018 tax return. “It was not an attempt at defrauding the U.S. government,” Carey said. Carey said the White House hasn’t raised alarm about the tax lien, which was reported earlier by the Guardian. Trump announced last week he would nominate Moore, a senior fellow at the conservative Heritage Foundation, for an open seat on the Fed’s board of governors. The White House hasn’t yet officially submitted Moore’s nomination to the Senate, which must vote to confirm him.